As policymakers respond to the threat of climate and environmental change, the concept of resilience has found itself at the center of discussion. Few scientists and policymakers, however, can come to a consensus on how to define, evaluate, and build resilience. The concept is sometimes defined as “the ability to bounce back.” But others argue getting back to a baseline is not enough – the goal should be to come back stronger, better positioned for the future, to “bounce forward,” as Professor Patricia Longstaff of Syracuse University put it at the Wilson Center last fall. For many who see resilience as a useful way to explain the connected nature of human and natural systems, this lack of consensus is a problem. “Two-point-six billion people will be added to the world population before 2050, and 98 percent of this population will be from the developing world, with almost 50 percent of it in sub-Saharan Africa,” said José Miguel Guzmán of ICF International. Understanding vulnerability and how to address it in development is therefore paramount. “Good policymaking needs to be based on sound evidence, and science can provide that evidence,” said Georgina Mace, a fellow in the UK’s Royal Society and director of University College London’s Center for Biodiversity and Environment Research. In an effort to better define resilience, the Royal Society co-hosted a day-long forum with leading thinkers at the Wilson Center in November. Kurtz has employed an approach at Mercy Corps based on testing predictive power and data against post-shock outcomes. “What tends to happen is that people stop there,” Kurtz said, and apply their findings on one aspect of resilience to all their efforts. But data on food security, for example, may not be transferable to understanding flooding or drought. Communities react differently to different challenges. This is especially true when talking about scales beyond the local level. “When we start to talk about subnational levels and market systems, those are a lot fuzzier and don’t really lend themselves to quantifying,” he said. The language and approaches used by researchers in different fields may play a role in making data less accessible to others, said Jason Bremner of the Population Reference Bureau. PRB does research on topics that can influence resilience – reproductive health, population dynamics, and their impacts on the environment – and Bremner believes that community-based climate adaptation projects can learn a lot from the integrated population, health, and environment (PHE) approach they advocate for, but both communities struggle with understanding resilience. Community-based adaptation and PHE projects “are not really focused on climate change resilience; they are not using a lot of the same language,” he said. Absent a clear framework about how to talk about resilience, they are not as useful to each other – and the communities they serve – as they could be. What Interventions Are Most Successful? Every community will respond to a crisis in an attempt to cope, but often, these coping mechanisms – whether on an individual or more systemic level – only serve to exacerbate the situation. One of the most frequent and potentially devastating results of climate change is displacement. In 2012, “more than 32 million people were displaced by weather-related disasters, and that is twice as many as the year before,” Thomas said. The biggest challenge to improving resilience, said Nalini Rao of ICF International, is the “cascade of uncertainty” surrounding the effectiveness of current approaches. “Ecosystem-based approaches are a very low risk approach, but they’re almost never enough on their own,” said Longstaff. The task of strengthening vulnerable communities is almost always a multi-stage and multi-sectoral effort that varies by locality. Often, “adaptation projects…don’t work [because the] local people haven’t been included,” said Petra Tsachkert of Pennsylvania State University’s Earth and Environmental Systems Institute. Efforts to recover from Hurricane Katrina illustrate the importance of community involvement and cooperation. Katrina “was a man-made disaster, and it’s something important to remember,” Malek-Wiley said. “We had a massive engineering failure.” Homes built to withstand high winds and rising tides were among the only ones to remain standing, including historic, raised-platform steamboat houses from the early 1900s. 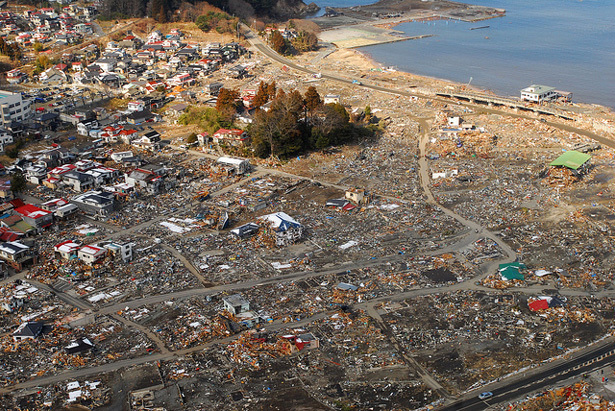 Photo Credit: Aerial view of Sukuiso, Japan, after the 2011 tsunami, courtesy of Dylan McCord/U.S. Navy.